Sophisticated is exactly how you are going to look wearing a mens full length camel color wool overcoat from Vinci. Style and versatility is always important when dressing for success matters. 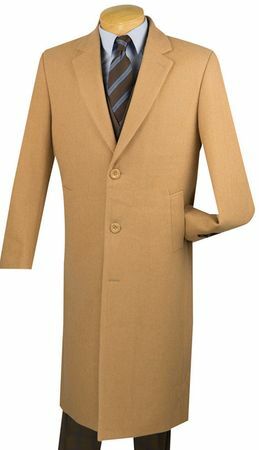 This full length camel color wool overcoat features a 48 inch length that comes down to your calf so you look great and warm at the same time. Made of 70% Wool/25% Viscose/5% Cashmere.